Bald eagles are one of the most iconic species in North America, with their white head and tail, and yellow beak and feet. Eagles do not acheive this look until about 5 years of age. Juveniles are dark brown/black mottled with white plummage. This juvenile is believed to have fallen from its nest. It was observed on the ground for over 24 hours without care from the adults. It's intake exam revealed it was underwight, but did not have any obvious orthopedic injuries. Blood work of the young eagle revealed that it was a bit anemic, likely from having not eaten. It was given Iron and B12 injections to help with this issue. It readily ate finger mullet when offered overnight. The young eagle was moved to an outside enclosure this morning. It will remain at the clinic for at least a week so that veterinarians are able to monitor its bloodwork to ensure everything returns to normal limits. A decision about re-nesting the eagle will be made will be made after this has happened. 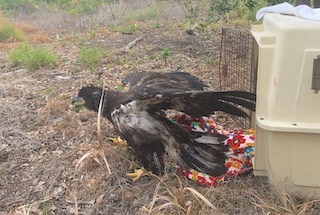 The eagle has shown a strong appetite since being admitted to the hospital. 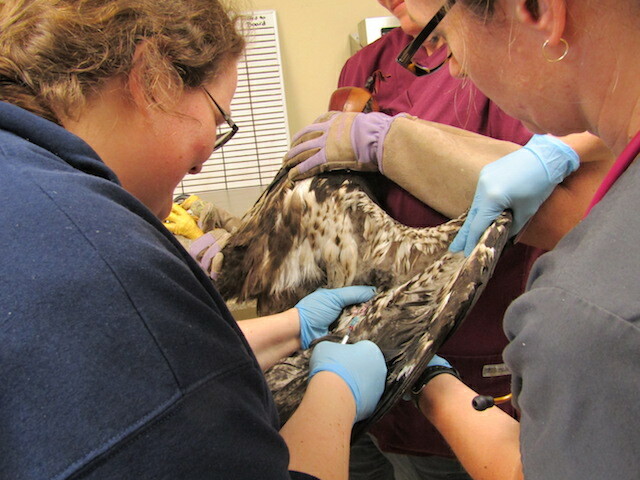 A re-check of blood work and if the eagle is attempting to fly, known as fledging, will help determine if the eagle is ready to be returned to its nest this weekend. Over the weekend, the blood work was re-checked and has shown that the anemia has resolved. Staff are working with the finder to get more information about the nest, which is believed to have two sibling eaglets. As a concern for the eagle getting pushed out of the nest again by its siblings, veterinarians will wait until it has improved its flight skills before returning it to the nest. It began making short flights over the weekend. 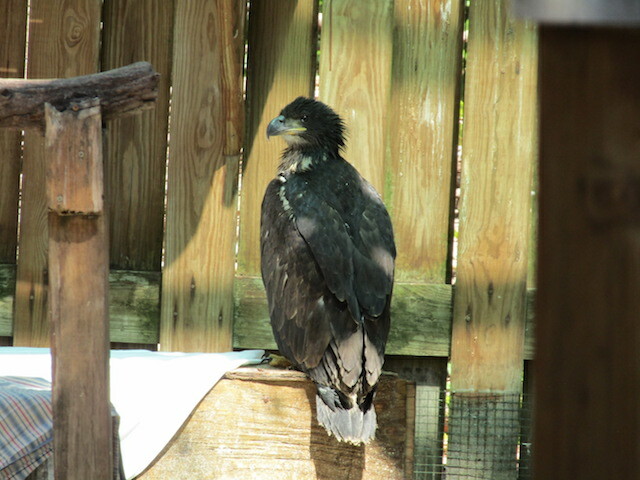 The young eagle has been observed making flights in the outdoor enclosure up to the top perches. It has been cleared for release back to the nest area. 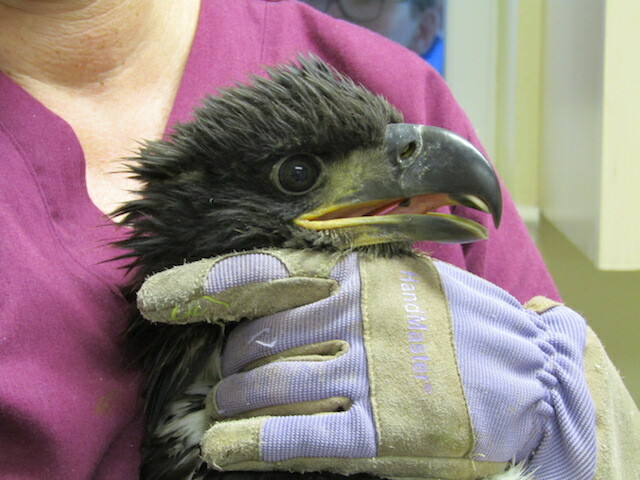 The young eagle was successfully released in the area of its nest. Both parents and siblings were observed in the nest tree. Over the weekend, one of our volunteers stopped by the nest to see if the eagle had returned with its siblings. 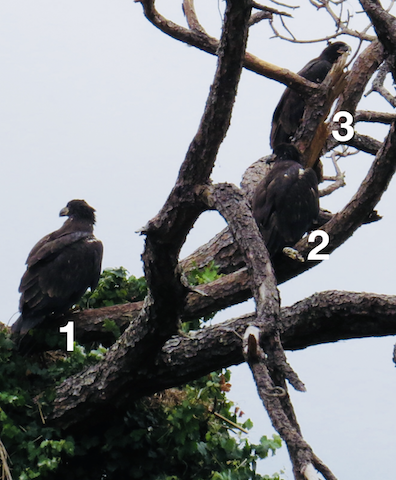 The volunteer was able to confirm that the young eagle had returned to the nest and snapped this photo of all three eaglets in the nest tree.